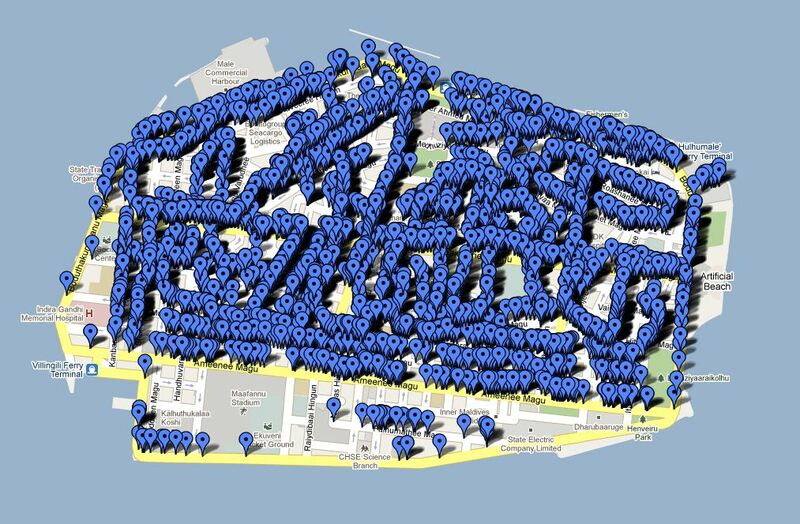 Male’ Wifi Access Points Geo-tagged! And it looks a bit like this…..
– observations made were made on the samples collected, i believe its a good representation of the whole. – Below Chart shows the encryption type in use. 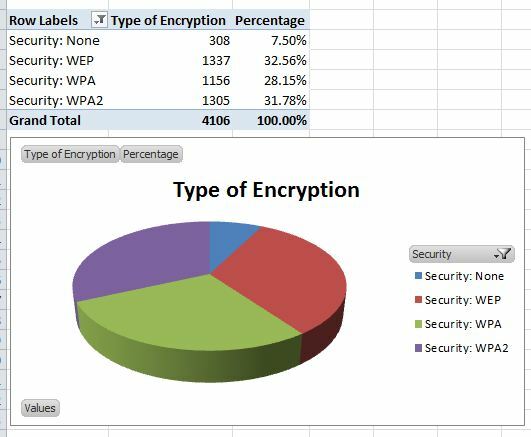 it’s nice to know 92.5 use some form of encryption still 308 is still a large number of points without any type of encryption, but Considering you really should be using WPA or WPA2 these days it’s still troubling that 40.06% use none or WEP encryption which is weak and easily breakable. 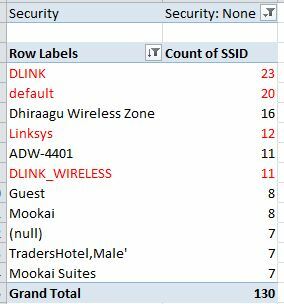 -large number of access points have repeated SSID’s, i’ve selected the top 10… of those there are a lot which are the manufacturer default or ISP default.. .which really shouldn’t be the case. it is very likely that these points are extremely vulnerable with default passwords or most used passwords as well. -using the data it is also possible to identify which access points have which type of encryption to identify the most vulnerable. 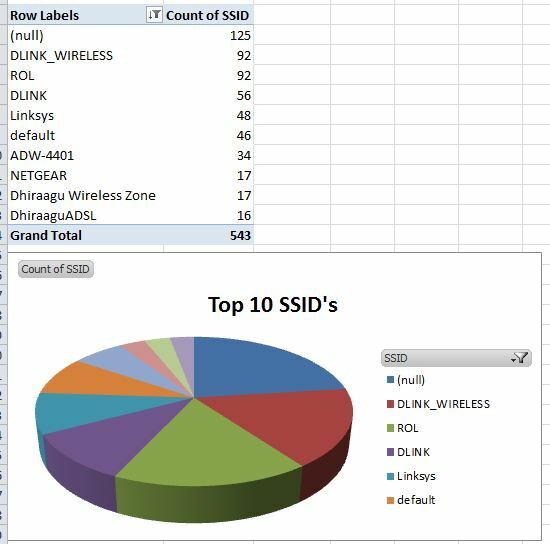 i’ve highlighted just a few as shown below where there are multiple SSID’s under same name and where no encryption is setup. 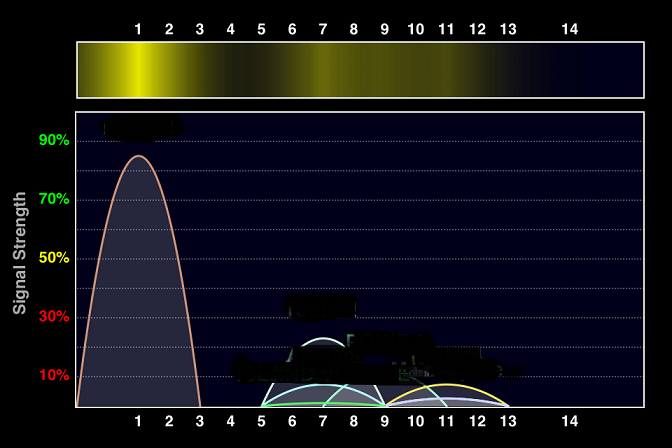 EDIIT : for non-techies : 2.4 Ghz is the frequency where wifi lives.. to be precise 2.401-2.495 Ghz depending on where you are(2.4Ghz b/g/n)… (it is unlicenced meaning you dont need a specific authority or permission to use italthough CAM has setup some guidelines for maximum power output… thats another story).. this range is split up to 14 channels 1 through to 14.. most routers don’t come with channel 14 enabled as it is not allowed in most countries… regulation wise… so the most common channels are 1-13.Thing is each channel takes a chunk of the whole 2.401-2.495 Ghz range… BUT…adjesant channels overlap.. lets put it into visual context here.. say channel 1 = 2.401–2.423 GHz and channel 2… 2.406–2.428 GHz, as you can see there is an overlap where 1 ends and 2 starts… this overlap results in interference which results in bad quality connection in general. 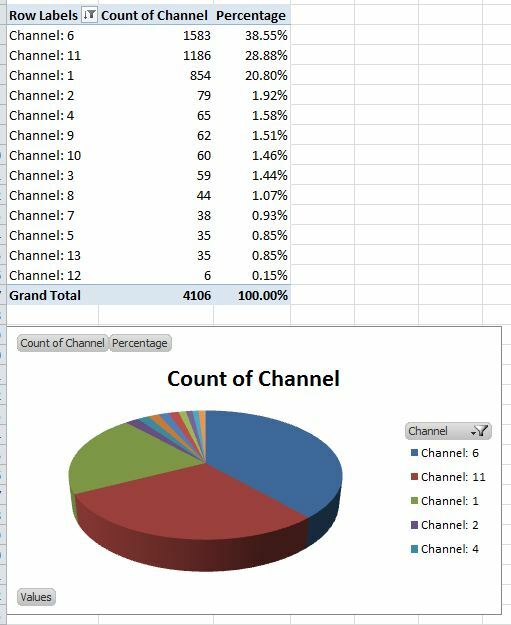 the diagram does a good job of explaining how channels overlap.. and as you can see the actual non-ovelapping channel ranges are 1, 6, 11.
above is the actual results of the site survey done near my wifi router… on channel 1 you can see my router.. routers around me are on the remaing channels with lower peaks.. but as you can see channel one is the cleanest channel around for me so i have set it up there which will result in me getting the best quality wifi signal possible.but the actual channel you choose depends on the channel usage at the location where you setup you access point.. which means a site survey is in order..
i am providing the files for download below i am also providing with a link for google maps overlay for you to play around with. i dont mind anyone using it for personal or educational purposes, but not for commercial work or profit…. i would appreciate a link back / attribution. do let me know if you use it for any of your projects. This entry was posted in Uncategorized and tagged access points, geo tagging, GPS, location, maldives, male', wifi, wireless on March 8, 2011 by ahmedriyazi.